Own a piece of history through Emerald Heritage, and inherit the Earth! Ask almost anyone about his or her idea of the most charming, most beloved country on earth, and in many cases the answer you’ll get back is the country of Ireland. 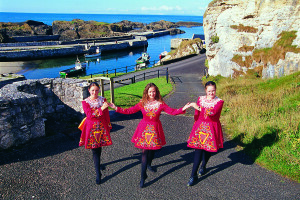 A picturesque, lush land known for its warm people, lilting music, scenic countryside and gift of gab, over the years Ireland has become a place well loved by millions, who visit to enjoy the charms of the people and their country. But over the years Ireland has also had its share of troubles, with contentious political issues and a tragic food shortage that resulted in thousands of Irish having to leave the country in search of more promising pastures, a period referred to as the Irish Diaspora. In spite of the problems, Ireland remains a lovely country, with plenty of history, charm and legions of enthusiast visitors every year. It’s also the ancestral home of over 150 million Irish living in other countries, who are still proud to call themselves Irish and have an ongoing emotional attachment to their heritage. 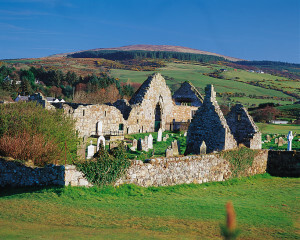 In recent years Ireland has been discovering ways to connect to its own heritage, to celebrate some of the greatness in its history and reestablish some of the resources that have been lost in centuries past. One of the most pressing concerns is the fact that Ireland has been heavily deforested, to the point where only 1% of Ireland’s original woodland remains today. It is by far the most deforested country in Europe. That was a number that got the attention of North Coast of Ireland’ and Irish Native Woodlands resident Lyn Nelson, who remembers seeing a story on television, recalling the horrors of the famine year and how during that period much of Ireland’s forests were sacrificed for more utilitarian purposes. Nelson got on her computer and began researching and digging, looking for a way to protect and eventfully recover some of the woodlands that were once so scenic on the Irish landscape. After much research she found that what she had heard on the news report was true. Her homeland, a country with a reputation for great scenic wonders and lush emerald-green landscape, is the least wooded country in Europe. Centuries of unchecked development had resulted in what amounted to an ecological disaster, and unless preventive measures took place immediately, the remaining landscape, that 1%, together with the plants, birds, and animals that call it home, would be irreplaceably lost. Looking for immediate solution, Nelson sought some legal criteria that she thought would be helpful in protecting the remaining landscape, and reached out to a number of lawmakers and organizations in the Antrim area and through the Channel Islands beginning in 2014. I have been a journalist and a writer for a very long time, but meeting someone like John is truly an honor and a privilege that happens once in a lifetime if one is lucky. I am lucky, and now, you the reader are lucky too for this never before opportunity is brought to you by John Langlois! Very few souls on Earth would be as committed and giving as John is making it possible for you “….that ‘you’ shall inherit the Earth…” Once you own a piece of this God given miracle we call Ireland, you shall truly inherit the Earth. A part of it at least! But, one is all and all is one! Before long Lyn and some of her associates, including media and filmmaking maven Roger Anderson, had created a website to help get the project launched. 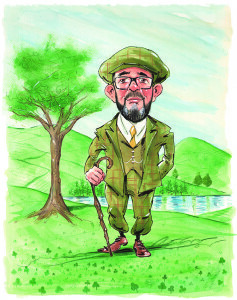 Roger had spent more than 25 years in various written and broadcast media, having won numerous awards and producing many documentaries over a decade spent with BBC Northern Ireland, so he was a perfect fit for the Emerald Heritage project. Not to mention that he has a fantastic sense of humor and it is more than a pleasure talking to him. He is very entertaining, be ready for a good time, and his deep commitment to this honorable cause is remarkable! 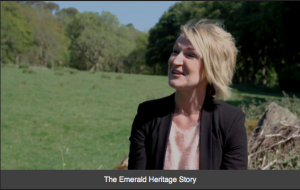 With the legal and financial issues sorted out and Anderson’s expertise in play in terms of creating strong, descriptive copy and compelling videos for the website, Emerald Heritage now began to magnetize people who were attracted to the project. And what country it is. A short visit to the coast of County Antrim and its Glens, where the Emerald Heritage organization is centered, is a visit to the spectacular. 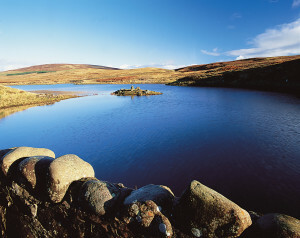 From Loughareena Lake to Dunluce Castle to the Bonamargy Friary to the dancers at Ballintoy Harbour, the area is full of Irish scenic charms, wave upon wave of high green hills, dotted with lush glens that all slope gently down to the Irish Sea through valleys carved out by glaciers at the end of the last Ice Age. The Ice Age! 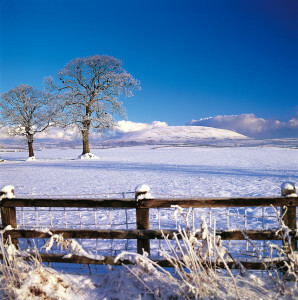 Most of our younger generation does not even believe that part of history, and here we have Ireland having a heritage of the Ice Age that you can touch, see and taste? What a miracle! 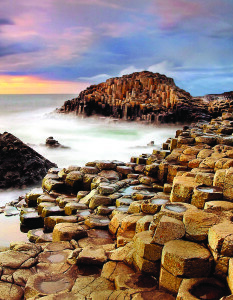 It’s near a place called the Giant’s Causeway, where residents still tell stories about the romantic, mystical Celtic legends and are everyday users of the Irish language. 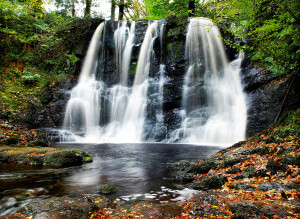 Steeped in Irish mythology, the Glens are a place of extraordinary natural beauty, an area that, as Van Morrison might say, can give you a sense of wonder. I would call it: immeasurable beauty! When your eyes tear up just by looking at the gift we have been given on Earth, you cannot ignore it! Our message, from those waning to become involved with the cause is this: you need to wake up and realize what is important in life and what is background noise. I feel as a “citizen” of this unbelievably mystical, joyous and unpredictable “thing” we call life that I have an obligation to do everything in my power to honor what we ALL have been given. Marvel at the beauty! Heal with its magic! Protect and save what has been given to you, to us, and know that we can literally change the world tree by tree. That is how simple it is! If you’re a fan of HBO’s “Game of Thrones” then some of Northern Ireland’s stunning Causeway Coast and Glens region, where the series is sometimes filmed, will be familiar to you. The area has been used extensively to represent everything from Winterfell to the King’s Road, Stormlands to the Iron Islands. And now, thanks to the Emerald Heritage project, it’s possible to actually own a piece of the real Westeros. 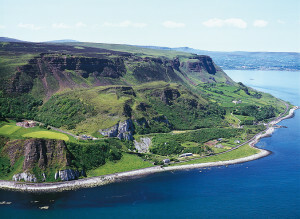 For as little as $50 (£29.99) it’s possible to purchase a one foot square souvenir plot of land in the glorious Glens Of Antrim where many pivotal scenes were filmed and ancient Celtic warriors walked long before Hollywood discovered the setting for one of television’s biggest hit shows. Before Hollywood was even on the map. Before Mary Pickford created the first artist owned studio ever and movie stars were born due to her policies and establishment. She was a remarkable woman. 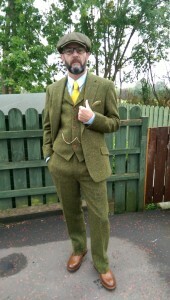 Beyond the obvious attraction for Games of Thrones fans, the Emerald Heritage organization was pleased to find out that the project had strong international appeal and many people, even the non-Irish, feel a deep emotional connection with Ireland. As the project develops over time it will become a model of what a grassroots ecological movement can do at the local level. Eventually we also hope to get sponsorship from companies and corporations that have an interest in helping to save the Irish countryside, bringing it back from the brink of complete deforestation. And the writer of this article has the perfect program for that. Anyone interested in supporting the cause with any amount will have the opportunity in a very simple and easy way to do just that, while also getting recognition for their good will and contribution. Also, golf courses are in the vision as I cannot imagine a more serene and peaceful place for big time golfers like Clint Eastwood, etc…who would want to go without the usual and constant disturbance of the paparazzi’s! Kimber and I are ready. As the project develops it will be Roger Anderson’s documentary skills that will record the progress being made to preserve the all-important woodlands on this part of the Irish coast. He foresees a multi-part documentary series that will be available sometime in 2017. Atlantic will post that all over on the Internet just to create awareness of this extraordinary artist’s work and message. “We want to show the world how we can all work together from a grassroots movement into something with global reach, to become a model of how a small but passionate organization can capture the imagination of group of people by allowing them a concrete connection with their homeland, while also making sure it will be a better place to live for generations to come,” Nelson says. Please click here to see their Accesswire PR release should you wish to buy a piece of this magical country. It’s not often that you get a chance to connect to a romantic and magical part of the Earth in a very real way. 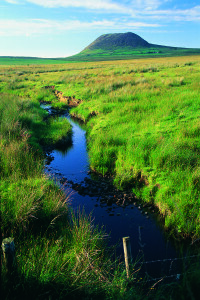 This place in Northern Ireland, the Glens of Antrim, has been exploited to the point of exhaustion, but the efforts of the people at Emerald Heritage and its thousands of subscribers have become shining examples of what a passionate organization can do when they get behind a critical project to preserve and enhance one of the most beautiful parts of the planet. It’s an effort that will provide positive results for the Irish people around the World, and its landscape for decades to come. All for one, one for all is the spirit that can truly make you feel you have left a remarkable touch on Earth, and your legacy will keep you alive. ‘For the good- hearted shall never die and will inherit the Earth’: A piece of magic that will always be there for you to cheer you up, to renew your soul because that is what the Irish are all about! They are magical, just like their country is. Disclaimer: At the time of tape recording the interviews with the people quoted in this article, fact checking and writing this piece based on the constant contact with the owners of property described above, were known to be true as facts!